Liddy B. and me: Bow, bows, bows. 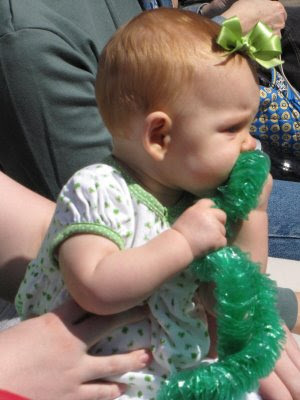 You may have noticed the bows in Lydia's hair lately. Her hair is FINALLY growing again and we are now able to clip a barrette in her gorgeous red locks. 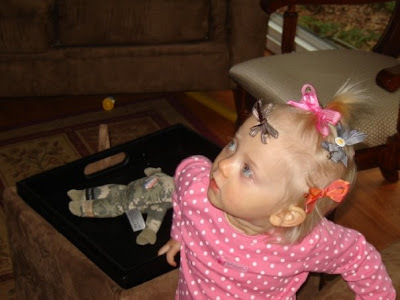 So I made her some more bows and took more pictures of her with bows in her hair. Soon my friend Andrea noticed the bows and asked if I could teach her how. So while visiting this weekend, we both put our girls down for a morning nap and began tieing and gluing bows to clips. Apparently after I left, ALL the bows went in Alyssa's hair AT THE SAME TIME. A definite fashion violation, but too funny not to share! A Fire Fighter Fifth Birthday Party! Staples Engineering Prints Are FABULOUS! Sea Food at Lydia's "Three Under the Sea Party"
Want to see all the new things I'm making? Follow me over to my NEW blog, The Repurposed Pumpkin, http://www.repurposedpumpkin.com, where I focus on unique crafting solutions using common or repurposed materials!